 Click here to see this document’s quote. 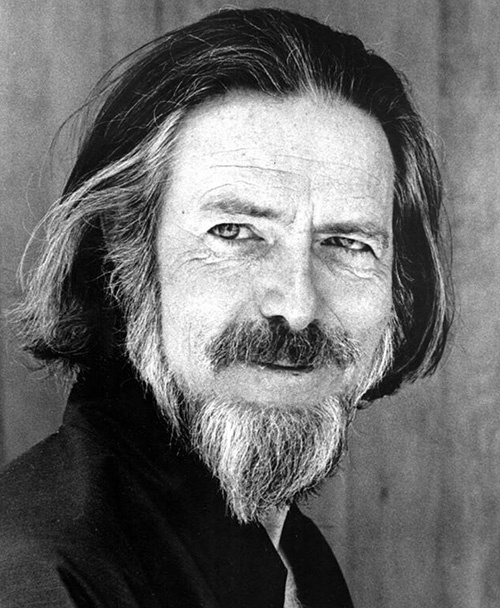 Part 1 of the Tao of Philosophy series is mostly comprised of shorter pieces taken from Alan Watts’ lectures. If you’d like to hear the lectures in their entirety, you can skip to the subsequent parts of the series. It has become extremely plausible that this trip between the maternity ward and the crematorium is what there is to life. And we still have going into our common sense the 19th-century myth which succeeded the Ceramic Myth in Western history—I call it the myth of the fully automatic model. Man is a little germ that lives on an unimportant rock-ball that revolves about an insignificant star on the outer edges of one of the smaller galaxies. But, on the other hand—if you think about that for a few minutes—I am absolutely amazed to discover myself on this rock-ball rotating around a spherical fire; it’s a very odd situation. And the more I look at things, I cannot get rid of the feeling that existence is quite weird! I know that—see, a philosopher is a sort of intellectual yokel who gawks at things that sensible people take for granted. And sensible people: Existence is nothing at all; I mean, it’s just—basic. Go on and do something. See, this is the current movement in philosophy. Logical analysis says you mustn’t think about existence; it’s a meaningless concept. Therefore, philosophy has become the discussion of trivia. No good philosopher lies awake nights worrying about the destiny of man, and the nature of God, and all that sort of thing, because a philosopher today is a practical fellow who comes to the university with a briefcase at nine and leaves at five. He does philosophy during the day—which is discussing whether certain sentences have meaning, and if so, what—and then he would, as William Earle said in a very funny essay, come to work in a white coat if he thought he could get away with it. The problem is he’s lost his sense of wonder. Wonder is like—in modern philosophy—something you mustn’t have; it’s like enthusiasm in 18th-century England, it’s very bad form. But, you see, I don’t know what question to ask when I wonder about the universe. It isn’t a question that I’m wondering about, it’s a feeling that I have. Because I cannot formulate the question that is my wonder. The moment my mouth opens to utter it I suddenly find I’m talking nonsense. But that should not prevent wonder from being the foundation of philosophy. So there is obviously a place in life for a religious attitude in the sense of awe—astonishment—at existence. And that is also a basis of respect for existence. We don’t have very much of it in this culture, even though we call it materialistic. In the culture that we call materialistic today we are, of course, bent on the total destruction of material and its conversion into junk and poisonous gas as quickly as possible. This is not a materialistic culture because it has no respect for material. And respect is, in turn, based on wonder. On feeling the marvel of just an ordinary pebble in your fingers. Look: Here is a tree in the garden, and every summer it produces apples, and we call it an apple tree. Because the tree apple-s; that’s what it does. Alright, now here is a solar system inside a galaxy, and one of the peculiarities of this solar system is that—at least on the planet Earth—the thing people-s, in just the same way as an apple tree apple-s. Now maybe two million years ago somebody came from another galaxy in a flying saucer and had a look at this solar system, and they looked it over and shrugged their shoulders and said, Just a bunch of rocks. And they went away. Later on—maybe two million years later—they came around, and they looked at it again, and they said, Excuse me! We thought it was a bunch of rocks but it’s peopleing, and It’s alive after all; it has done something intelligent. Because, you see, we grow out of this world in exactly the same way as the apples grow on the apple tree. If evolution means anything, it means that. But, you see, we curiously twist it. We say, well, first of all—in the beginning—there was nothing but gas and rock. And then intelligence happened to arise in it—you know, like a sort of fungus or slime on top of the whole thing. But we’re thinking in a way, you see, that disconnects the intelligence from the rocks. Where there are rocks, watch out! Watch out! Because the rocks are going, eventually, to come alive. Theology has not, as a matter of fact, had a very distinguished record in promoting the study of other than the Christian religion. If you know, in the first place, that you have the true religion, there really is no point in studying any other one, and you can very quickly find reasons for showing them to be inferior because that was a foregone conclusion; they had to be. Because if, for example, you get into discussions as to whether Buddha was a more profound and spiritual character than Jesus Christ, you arrive at your decision on the basis of a scale of values which is, of course, Christian. And in this sense the judge and the advocate are the same. Now, as you know, I’m not being very fair and very kind to modern theology. But there is this strange persistence of insisting that our group is the best group. And I feel that there is, in this, something peculiarly irreligious, and furthermore it exhibits a very strange lack of faith. Because I believe that there is a strong distinction between faith on the one hand, and belief on the other. That belief is, as a matter of fact, quite contrary to faith. Because belief is really wishing—it’s from the Anglo-Saxon root leif, to wish —and belief stated, say, in the Creed is a fervent hope that the universe will turn out to be thus and so. And in this sense, therefore, belief precludes the possibility of faith because faith is openness to truth, to reality; whatever it may turn out to be, I want to know the truth. That is the attitude of faith. And therefore, to use ideas about the universe and about God as something to hang on to in the spirit of Rock of ages, cleft for me, and there’s something very rigid about a rock. And we are finding our rock getting rather worn out in an age where it becomes more and more obvious that our world is a floating world. It’s a world floating in space where all positions are relative and any point may be regarded as the center. A world which doesn’t float on anything, and therefore the religious attitude appropriate to our time is not one of clinging to rocks but of learning to swim. And you know that if you get in the water—and you’ve nothing to hold on to, and you try to behave as you would on dry land—you will drown. But if, on the other hand, you trust yourself to the water and let go, you will float. And this is exactly the situation of faith. I had a friend who was studying Zen in Japan, and he got pretty desperate to produce the answer of who he really is. And on his way to an interview with the master to give an answer to the problem, he noticed a very common sight in Japan: a big bullfrog sitting around in the garden. And he swooped this bullfrog up in his hand and dropped it in the sleeve of his kimono. And then he went in to the master, and to give the answer of who he was he suddenly produced the bullfrog. And the master said, Uh-uh, too intellectual. In other words: this answer is too contrived, it’s too much like Zen. You’ve been reading too many books, it’s not the genuine thing. And so the method of teaching used by these great Eastern teachers is to make fools persist in their folly—but very rigorously and very consistently, and very hard. Now, if you go to a Zen teacher he’ll say, Why, I have nothing to teach! There is no problem, everything’s perfectly clear. And you think that one over. And you say, He’s probably being cagey. But the teacher says, Quite honestly, I haven’t anything to tell you. I don’t teach anything, I have no doctrine. As I said to you in the beginning of this talk, I have nothing whatsoever to sell you. So the student thinks, My, this is very deep! Because this nothing that he’s talking about, this nothing that he teaches, is what they call in Buddhism śūnyatā, and it’s supposed to be the ultimate reality. But, as you know, if you know anything about these doctrines, this doesn’t mean real nothingness—not, kind of, just nothing there at all; not just blank—but it means no-thing-ness. It’s the transcendental reality behind all separate and individual things, and that’s something very deep and profound. So he knows that when the teacher said, I have nothing to teach, he meant this very esoteric no-thing. Well, he might also say, Then, if you have nothing to teach, what are all these students doing around here? And the teacher says, They are not doing anything, they’re just a lot of stupid people who live here. And he knows again, you see, this stupid doesn’t mean just straight stupid, but the higher stupidity of people who are being humble and don’t have intellectual pride. The Christian proverb is that man’s extremity is God’s opportunity—and so people, in other words, have to get desperate. Imagine the idea that the moment you were born you were kicked off the edge of a precipice, and you’re falling. As you fell, a great lump of rock came with you—and it’s traveling alongside you—and you’re clinging to it for dear life, and thinking, Gee, I’ve got to hold on to this! You see? But it doesn’t do a thing for you. And it’s only making you anxious. And it’s only when you understand that it doesn’t do a thing for you, that you let go and relax. So everybody’s in this situation. We’re all completely insecure, we’re all headed straight for death as if we had been condemned by a judge. And yet, here we are, all clinging on to things. And we have all sorts of alibis for doing this; we say, Well, I have responsibilities for my dependents and I’ve got to cling on, but all you’re doing is you’re teaching your dependents to cling in the same way as you are. Making them miserable by learning to go on surviving compulsively. So the thing is [the] same way if you’re caught in a torrent, and you try to get out of it by swimming against it, you’ll just wear yourself out and you’re still carried along with it. So the sensible thing to do is to turn around and swim with it. And if you want to get out of it, swim towards the edge. But go with it. Same way when you’re sailing: always keep the wind in your sails. If you want to go against the wind, tack! But use the wind. So it’s this way, you know: we’re all in this great stream of change which we call life. We are the stream. If you imagine you’re separate from it and you’re being carried along by it as if you were a cork, that’s a delusion. You’re a wave of the stream itself. So get with it! So you perform a discipline, by experiment. By reductio ad absurdum of these premises. And so, in the same way, the guru—whether Hindu or Buddhist—performs a reductio ad absurdum on the premise of the skin-encapsulated ego. Well, what happens then? You might imagine—from garbled accounts of Eastern mysticism—that one thereupon disappears forever into an infinite sea of faintly mauve Jello, and become so lost to the world and entranced that you forget your name, address, telephone number, and function in life. Nothing of the kind happens. The state of mystical illumination—although it may, in its sudden onset, be accompanied by a sensation of tremendous luminescence and transparency—as you get used to it, it’s just like everyday life. Here are the things that you formerly thought were separate individuals, and here’s you, who you formerly thought was merely confronting these other people. When the great Dr. D. T. Suzuki was asked, What is it like to be enlightened? he said, It’s just like ordinary everyday experience, except about two inches off the ground. Because what is altered is not the way your senses perceive, what is altered is what you think about it. Your definitions of what you see. Your evaluation of it. So when you don’t cling to it, when you have no longer a hostile attitude to the world—because you know the world is you. It is. I mean, let’s take it from the point of view of biology. If I describe the behavior of a living organism, I cannot possibly describe that behavior without simultaneously describing the behavior of the environment. So that I discover that I don’t describe organisms in environments, I describe a unified field of behavior called an organism-environment. It’s an awkward word, but there it is. The environment doesn’t push the organism around, the organism doesn’t push the environment around. They are two aspects, or poles, of the same process. You see, in the history of philosophy, and poetry, and art, we always find the interchange of two personality types which I call prickles and goo. The prickly people are advocates of intellectual Porcupinism, they want rigor, they want precise statistics, and they have a certain clipped attitude in their voices—and you know that very well in academic circles, where there are people who are always edgy like that. And they accuse other people of being disgustingly vague, and miasmic, and mystical. But the vague, miasmic, and mystical people accused the prickly people of being mere skeletons with no flesh on their bones. They say to you, You just rattle! You’re not really a human being. You know the words but you don’t know the music. And so, therefore, if you belong to the prickly type, you hope that the ultimate constituent of matter is particles. If you belong to the gooey type you hope it’s waves. If you’re prickly you’re a classicist, and if you’re gooey you’re a romanticist. And—going back into medieval philosophy—if you’re prickly you’re a nominalist, if you’re gooey you’re a realist. And so it goes. But we know very well that this natural universe is neither prickles nor goo exclusively. It’s gooey prickles and prickly goo and, you see, it all depends on your level of magnification. If you’ve got your magnification on something so that the focus is clear, you’ve got a prickly point of view. You’ve got structure: shape, clearly outlined, sharply defined. We go a little out of focus and it’s gone blleeeaaaahh, and you’ve got goo. But we’re always playing with the two. It’s like the question, Is the world basically stuff—like matter—or is it basically structure? Well, we find out, of course—today, in science—we don’t consider the idea of matter, of there being some sort of stuff . Because supposing you wanted to describe stuff: in what terms would you describe it? You always have to describe it in terms of structure, something countable, something that can be designated as a pattern. So we never get to any basic stuff. There is a sense in which the universe is purely game—but not in the sense of a one-upmanship game, but in the sense of music—which is lowing with sound, is dancing delightfully with sound, you see? Oee-oee-oee-oee-oee-oee-oee-oee-oee-oee-oee-oee-oee-oee, and nobody was ever able to give a better account of what it’s all about. I mean, let’s take the traditional Christian account of what the angels do in heaven: why they sit around the throne of God and sing Alleluia, Alleluia, Alleluia, and again, you know? See, it’s not just Alleluia in a sort of formal way, but they’re going ja-hoo-dee-da-dee, hoo-dee-da-dee, hoo-dee-da-dee hoo-dee-da, ha-cha-cha-cha-cha, choo-dee-da-dee, doo-dee-da-dee, doo-dee-da-dee, you know? They’re really swinging! And by the time you know where they are the swinging has reached such fantastic proportions, and they’ve thought out the most amazing little goo-jee-doo-dee-doo-dee-doo-dee-doos that you’ve got the whole physical universe happening. You know? That’s the way it starts. So this game is great. In music, though, one doesn’t make the end of a composition the point of the composition. If that were so the best conductors would be those who played fastest. And there would be composers who wrote only finales. People would go to concerts just to hear one crashing chord, because that’s the end! Say, when dancing, you don’t aim at a particular spot in the room; that’s where you should arrive. The whole point of the dancing is the dance. But we don’t see that as something brought by our education into our everyday conduct. We’ve got a system of schooling which gives a completely different impression. It’s all graded. And what we do is we put the child into the corridor of this grade system with a kind of, C’mon kitty, kitty, kitty! And now you go to kindergarten, you know? And that’s a great thing because when you finish that you get into first grade. And then—c’mon!—first grade leads to second grade, and so on, and then you get out of grade school and you go to high school, and it’s revving up—the thing is coming!—then you’re going to go to college, and by Jove then you get into graduate school, and when you’re through with graduate school you go out to join the World. And then you get into some racket where you’re selling insurance, and they’ve got that quota to make. And you’re going to make that. And all the time this thing is coming. It’s coming! It’s coming! That great thing, the success you’re working for. Then, when you wake up one day—about 40 years old—you say, My God, I’ve arrived! I’m there! And you don’t feel very different from what you always felt. And there’s a slight let-down because you feel there’s a hoax. And there was a hoax. A dreadful hoax. They made you miss everything by expectation. Look at the people who live to retire and put those savings away. And then, when they’re 65, they don’t have any energy left, they’re more or less impotent, and they go and rot in an old people’s— Senior Citizens —community. Because we’ve simply cheated ourselves the whole way down the line. We thought of life by analogy with a journey, with a pilgrimage, which had a serious purpose at the end and the thing was to get to that end. Success—or whatever it is, or maybe heaven—after you’re dead. But we missed the point the whole way along. It was a musical thing and you were supposed to sing, or to dance, while the music was being played. Why is it that all those old English songs are full of foll dee riddle aido, and hey nonny, nonny, and all those babbling choruses? Why is it that when we get hip with jazz we just go boo-dee boo-dee boop dee boo, and so on, and enjoy ourselves swinging it? It is this participation in the essential, glorious nonsense that is at the heart of the world—that isn’t going anywhere, that is a dance. But it seems that only in moments of unusual insight and illumination that we get the point of this, and find that thus the true meaning of life is no meaning, that its purpose is no purpose, and the its sense is non-sense.